HHS said that they could not locate any records which were responsive to the specific request. They did not say that no testing has been done. Can I do that with my taxes? I paid, but can't find the check. My bank uses microfiche, I think. I haven't received my original checks from the bank in years. I don't even get a paper statement. But you should use your credit card to pay your taxes. There were anti-vaccine folks then also. That's where the cases of Polio came from in those years just after the vaccines were developed. It's easy to pretend otherwise due to an unfounded paranoia. Heck, there are people who think the entire medical community is out to get them. I know two such people myself. They feed off of this stuff and use it as validation, never considering the fact of how long we live now and how healthy we are compared to the time before modern medicine. If they are out to get us they are failing because we just keep living longer and longer and are more healthy. Here we go again with either "you must accept unsafe vaccines or none at all" type mentality. However, there are some vaccines that might not be necessary to use as much, such as flu vaccines. There are billions of kids these days who grew up without having to take flu vaccines, or at least not as much as in the U.S., and didn't die from whooping cough or from the flu because our way of life has changed so much since the early 1900s. Many of us did take other vaccines (which were probably safer than they are now), which btw studies have also shown that multiple vaccines in one go on babies can also cause damage on the health of the children since it puts their immunity systems in overdrive. Again, this is not saying "let's get no vaccines for children", but rather that because a baby's constitution is still weak, babies should be getting "SAFER VACCINES" separated, instead of in one go. Not to mention the fact that there are studies which indicate the flu mutates/changes from one season to the next, and vaccines are made from the flu strain of the previous season rendering vaccines ineffective against the newly mutated flu. Then there is also the fact that how flu vaccines are made, by growing the vaccine components in chicken eggs, makes the flu vaccine less effective if not entirely ineffective in humans. In case you didn't know, whooping cough can also be treated with antibiotics if caught early. So again, it isn't "just vaccines which allowed us to give us the lifespan we have now, and it wasn't the only advancement in science that got rid of most diseases." Our sciences have advanced in many ways, not just vaccines. Our way of life has also advanced in ways that has improved the lives of billions of people, all of it helped cure, or almost got rid of many diseases. This claim that "vaccines were the only thing that saved us" is simply not true. Again, asking for safer vaccines is not the same as being anti-vaccines. However, there are "vaccines that are necessary" and should be made safer. Heck, all vaccines should be made safer, and that's what most of us people like you label as "anti-vaccine" in fact just want... safer vaccines. Also, the amount of vaccines children used to have before 1986 compared to how many vaccines the CDC claims children in the U.S. must have now has tripled. In case you didn't know, in Europe and other countries children don't have to take as many vaccines as children in the U.S. Have the lives, or lifespans of children in Europe become worse because of it? No. Again, stating the fact that overloading children with vaccines as it happens in the U.S. is a bad idea, is not the same as stating "children in the U.S. should get no vaccine at all..."
The misuse/overuse of antibiotics has unintended consequences as well, which include an increase in fatal diarrhea in children, wiping out good gut bacteria, teaches good bacteria to "go bad," increases the cases of untreatable gonorrhea, and increases how many times children must be taken to hospitals. Then there is the association found in the excessive vaccination children in the U.S. have been getting, which no other children in other nations including Europe receive, and it's link to neurological disorders such as autism and ADD in children and persons who are genetically predisposed. This type of argument you are making is similar to the political climate the left has been leading us into. ""Either you agree with us completely and ask no questions, and have no concerns or you can't have a say..."
edit on 2-11-2018 by ElectricUniverse because: add and correct comment, and links. I don't think we were talking about the overuse of antibiotics? The problem I'm pointing out is that vaccines are not dangerous as they are. Problems from them are so rare, they are safer than aspirin are they not? I believe that is true. You see what happens is people use this stuff to validate dangerous behavior. Put their own children's and their own lives and health at risk. How is not leaving it up to the consensus of qualified medical professionals not preferable? Vaccines by and large do work imo, but you need checks and balances. Especially over decades. Companies cut corners to save money all the time. Just because vaccines work, doesn't mean they should not be inspected for safety, every year. The fact that the FDA is the body that supposedly inspects and approves vaccines, if not true is alarming. The fact that the FDA is the body that supposedly inspects and approves vaccines, if not true is alarming. It is apparently true that HHS did not furnish required reports to Congress. It is not true that vaccines do not undergo safety trials, testing, and monitoring. If the lawsuit was dismissed, what did the Government lose? Exactly? These reports had to be in the records of the HHS, yet the response is that they could not find any reports, not even at the Federal Court Records. Hence why both parties agreed to a dismissal of this particular lawsuit which was a demand for the records. Other lawsuits will ensue on the matter because of this response. 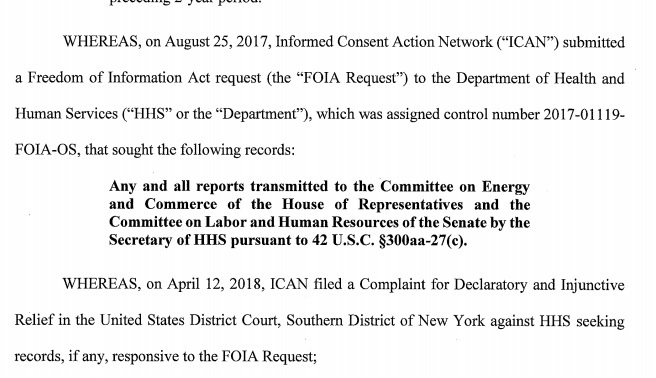 Which, btw if you notice "the Committee on Energy and Commerce of the House of Representatives" and the "Committee on Labor and Human Resources of the Senate" should have been getting these reports every 2 years, and then these reports had to be kept at the Federal Court records. Since there are no records for these reports, then neither Committee of the House of Representatives, nor the Senate have been getting these reports as they should have. Both committees have a lot to answer for as to why they haven't demanded these records every 2 years for 32 years. edit on 2-11-2018 by ElectricUniverse because: add and correct comment. I know. That's what I said. Except that the reports to Congress were supposed to be from HHS. These reports had to be in the records of the HHS, yet the response is that they could not find any reports, not even at the Federal Courts Records. Why would reports which were to be directed to Congress appear in Federal Court Records? Why would anyone look for them there? Hence why both parties agreed to a dismissal of this particular lawsuit which was a demand for the records. Yes. What lawsuit are you talking about?